...or, the November I did AcWriMo. But more on that in a moment. On Friday, November 1st, I met the biggest deadline of my career thus far. The deadline was not just for my application materials (pictured). 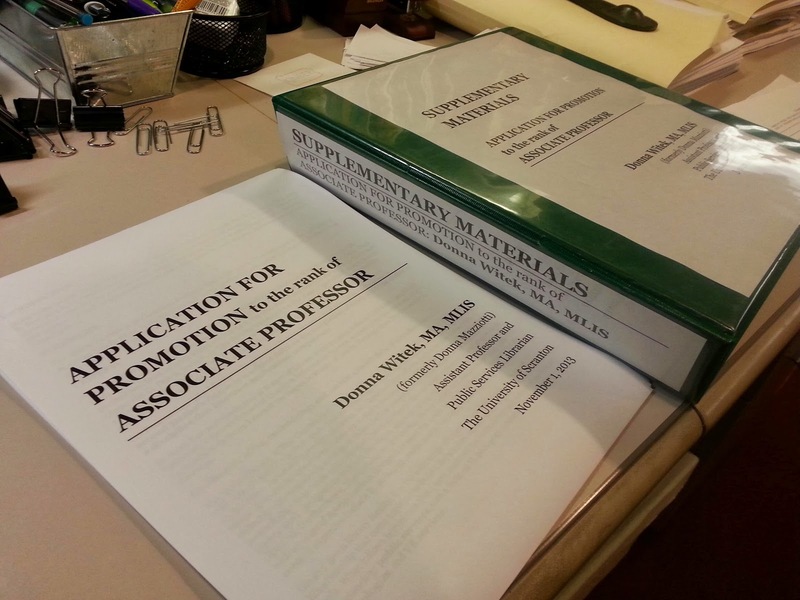 It was the deadline by which I needed to have met five qualifying criteria for promotion to the rank of Associate Professor, having to do with my three areas of faculty responsibility: librarianship, scholarship, and service. Without describing them in detail, suffice it to say, the requirements are very involved, time consuming, and challenging, each in its own way. By far the most challenging was the scholarship criterion -- which is, basically, that I need to have "substantial" scholarly activity in my field that is juried/refereed/peer-reviewed, etc., and in my profession the minimum I was given was "two peer-reviewed journal articles, published or accepted for publication by the time of application," which thankfully I have. I also needed to complete my Master of Arts in Theology degree. My mantra this past year has been: "Just get to November 1st, Donna." And, by God's grace, and the immense support of my husband, Paul, and my amazing research partna', Teresa, I made it: My application is in, and I actually feel good about my chances of being promoted by my colleagues on the Board of Rank and Tenure at my institution. Either way, I don't need to worry about it again until January, when my meeting before the Board will be scheduled. Another thing I've been looking forward to is getting past November 1st so I can do my research and scholarly activities without the punitive "whip" of a career making-or-breaking timeline under which I needed to work. I can do my research at the pace that best suits the project, not my academic timeline. I feel very excited about this next chapter in my work, and have a plan in this upcoming year for research that is feasible, exciting, and important. I'm feeling very motivated by this freedom. So, on Friday when I returned to my Twitter stream after being away for a few days, I realized a community of practice called AcWriMo was a perfect fit for this next month in my academic life. Like NaNoWriMo and NaBloPoMo, AcWriMo takes place during the month of November, during which participants post their writing goals publicly and have a commmunity of fellow writers with whom to share progress, and from whom to receive support. If it isn't obvious from its name, AcWriMo is a community of practice dedicated to academic writing. GOALS: 1 application for promotion completed and submitted; 1 journal article drafted; 1 article query sent; 1 co-authored book chapter drafted; 1 IRB application revised; 2 metaliteracy blog posts published; 1 masters thesis blog post published; 2 peer evals written and submitted. PLAN: Work uninterrupted on at least one goal per work day for 1-2 hours. Ambitious? Perhaps. And I wonder if I'm setting myself up for "failure" by fully admitting that for a few of these, if I can just end the month with a decent amount of progress made, I will be satisfied, since I can continue to work on them in December. The key for me is that I make a concerted effort to work on all of these this month, so when December comes I won't be starting from scratch on any of them. The co-authored book chapter as well as the peer evaluations are due by the end of this month, so they will definitely be completed. I admit that I cheated a bit: I declared these goals yesterday, on November 2nd; I accomplished the first goal on November 1st. But, if 20 pages, single-spaced, of me 1) explaining what it is I do as a faculty librarian, and, 2) making my case for academic promotion to my faculty colleagues, doesn't count as academic writing, I'm not sure what does. And it felt good to start off the month on such a good foot. The journal article I hope to draft will use a substantial amount of past writing cut from a different article, but to revise it into what I want it to be I need to do some more research, as well as a fair amount of new writing for it. So, while this is still the biggest goal listed (aside from the promotion application), I won't be starting from scratch on it, so I have a good chance at completing it. And finally, as you can see, blogging figures into my goals as well; more specifically, blogging related to the Metaliteracy MOOC I'm in, which I needed to take a hiatus from in order to finish my thesis and apply for promotion. I'm hoping to return to it (and catch up on past MOOC talks) later this week. I'll be tweeting with #AcWriMo about this experience. Wish me luck! And for any other AcWriMo folk reading this: Go forth and write (academically)!